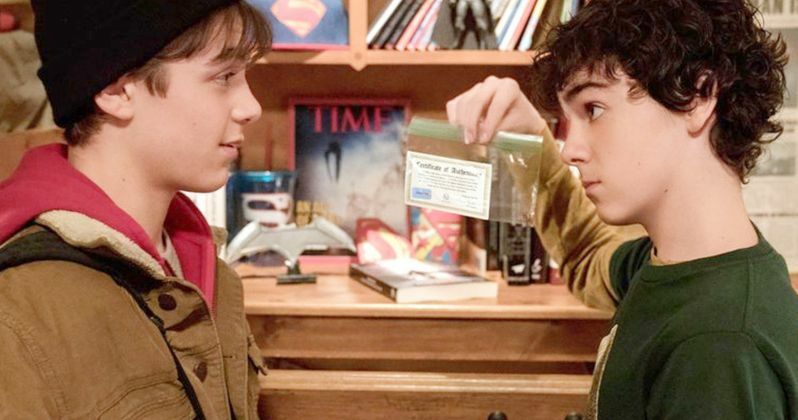 Will Batman or Superman be showing up in Shazam? That's possible, as we have confirmed proof that the superheroes are alive and well in this corner of the DC universe. A new photo featuring Asher Angel as young Billy Batson has arrived. And if it proves one thing, it's that Billy and his friend Freddy are huge fans of both the Man of Steel and the Caped Crusader. The image in question features Billy and his foster home friend Freddy in a bedroom that is decorated in some DC paraphernalia. There is a Superman hat, a Batman action figure, and some DC comics on display. Look closer and you'll notice a Time magazine featuring Kal-El in flight. And taped to the bedroom wall is a page from the newspaper heralding Superman's return. In Shazam, Billy Batson is an orphan who suddenly finds himself endowed with the power to turn into a superhero. He has been granted these magical powers by a crazy old wizard played by Djimon Hounsou. To turn into his hulking, older alter ego, all Billy has to do is say the word, 'Shazam!' And suddenly he looks like Zachary Levi in a muscle suit. About his character Billy, Asher Angel had this to say. "He's misunderstood, he's mischievous, he's been a foster kid since he was 5 years old and really has no one to trust,." The movie begins with Billy moving into his new foster home, where he meets and befriends DC fanboy Freddy. Jack Dylan Grazer plays Freddy, and had this to say about his character. "Freddy's a fanboy when it comes to Batman, Superman, the Justice League, so he becomes Billy's mentor and sansei when it comes to being a superhero." We can probably guess that the Batman toys belong to Freddy. But it's Billy who owns the word 'Shazam', which actually turns him into a real life superhero. During the grueling audition process, Asher Angel explains that he would constantly practice the deliver of this line over and over again. "Oh my god, I can't even tell you how many times I practiced saying it! My family and friends are asking if I'll ever get sick of saying 'Shazam!' I'll never be sick of it. Ever." We have the photo full of Batman and Superman Easter eggs for you to pour over here. You may be wondering what's in the bag Billy's holding. It's a crushed bullet with a certificate of authenticity that it came from Superman. If you look even closer at the photo, you'll spot some Superman cups and an authentic Batman Batarang that once belonged to the Dark Knight. The image comes from Entertainment Weekly.